Preface. Part 1. 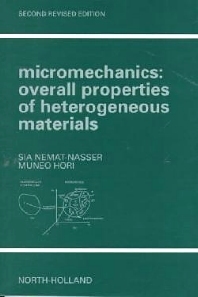 Overall Properties of Heterogeneous Materials. 1. Aggregate properties and averaging methods. II. Elastic solids with microcavities and microcracks. III. Elastic solids with micro-inclusions. IV. Solids with periodic microstructure. Part 2. Introduction to Basic Elements of Elasticity Theory. V. Foundations. VI. Elastostatic problems of linear elasticity. Author index. Subject index. The material is organized into two parts preceded by a précis. Part 1 consists of four chapters which are organized into fourteen sections and four appendixes. It deals with materials with microdefects such as cavities, cracks, and inclusions, as well as with elastic composites. Part 2 consists of two chapters which are divided into seven sections. It provides an introduction to the theory of linear elasticity, added to make the book self-contained, since linear elasticity serves as the basis of the development of small-deformation micromechanics.